What is the garage sale like? The Great Glebe Garage sale is organized and put on by the Glebe Community Association and gets a lot of its help through volunteers in the neighbourhood. These aren’t the only people helping out, the homeowners from the neighbourhood are the backbone of this event. Members of the community do their best to help out by putting vendor tables on their front lawns and porches with filled items from their homes that they’re looking to sell to a new owner. What is the GGGS like? The Glebe is one of those neighbourhoods with a lot of culture, you’ll instantly pick up on it when you visit there, and the Great Glebe Garage Sale is just one of those events that is an example of how great this area is. The Great Glebe Garage Sale is put on by the Glebe Community Association and it has strong ties with the Ottawa Food Bank. At the end of a successful sale day, vendors are encouraged to donate 10 percent of their earnings to the Ottawa Food Bank. It’s a perfect way to spend a warm spring day with iced teas in hand and browsing through all of the kitschy and eclectic items that vendors are selling. Who knew that scoring a one of a kind cat table lamp could benefit your living room and the Ottawa Food Bank? The Great Glebe Garage Sale is taking place this year on May 26th 2012 from 9:00am to 3:00pm. The garage sale will be taking place in the heart of the Glebe along Bank St. south of highway 417. You won’t have a problem finding it! Visitors are encouraged to walk, bike or take the bus there. 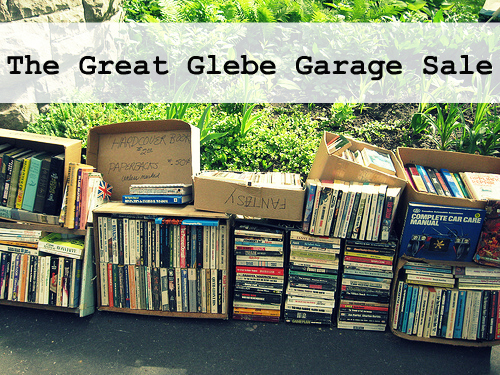 Have you ever gone to the Great Glebe Garage Sale? Did you love it? What kinds of crazy items did you see? We’d love to hear your thoughts! Maybe when you go to the GGGS this year, you’ll end up eyeing some of the gorgeous houses that this neighbourhood has! Curious about what housing opportunities are in the Glebe? Check out the Glebe Neighbourhood page and contact Chris to get you started on your house hunt!